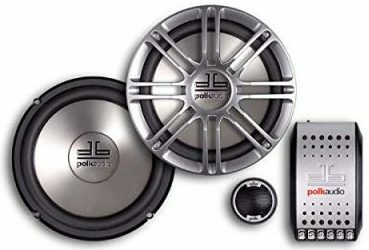 What are the best 6.5" Component Speakers for Cars? The issue around which is better, coaxial or component car speakers is arguably the most hotly debated topic in car audio systems today, but have you ever wondered what all the noise is about? What are the essential differences between component and coaxial speakers, and why are some audiophiles so passionate about the issue? Does it really matter what kind of speakers you have if you only listen to the news and traffic reports on your way to work and back? Well, no, it does not matter then, but serious audiophiles have other concerns, such as stereo imaging, crossover effectiveness, and the overall quality of sound reproduction, with the quality of low, bass frequencies being particularly important. These are serious issues to people who listen to their sound systems with a critical ear, and minor considerations like personal preference, price, and the trouble that comes with installing a superior sound system often play no part in the final decision. Nonetheless, there are far too many issues and considerations that come into play when deciding which is better, coaxial or component speakers, to settle the debate definitively here. What this article can do however, is to provide a brief overview of the defining differences between the two types of speakers and how they work, as well as a selection of component speakers that we believe will go some way toward helping you make an informed decision. Humans can only hear sound frequencies between 20 Hz, and 20 KHz, and while both types of speaker can reproduce frequencies in this range fairly accurately, it is the “image” of the total mix of frequencies that is influenced by how the speakers are arranged in the vehicle interior. The sound, or stereo “image” can be roughly compared to the resolution of a photograph; the higher the resolution, the more details are visible in the picture. Thus, the sound image refers to how well all the various frequencies that make up a music track can be heard, without some frequencies being drowning out, or masked by distortion of the speaker cone material. Both types of speakers have advantages and disadvantages when it comes to producing a true reproduction of the sound image, but for the most part, it takes an expert in automotive sound systems to discern the differences. 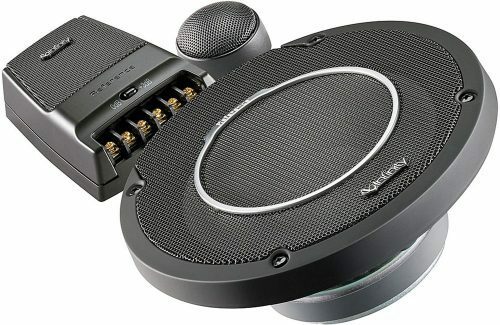 Also known as “separates” or “standalones”, component speakers do not have other speakers, such as tweeters mounted on the same chassis, hence the name, “standalone”. Each speaker, regardless of its size, can be mounted, or installed on its own, with other “standalones” installed elsewhere, but with crossovers connected between them to divert certain frequencies to the speaker that is designed to reproduce those frequencies best. 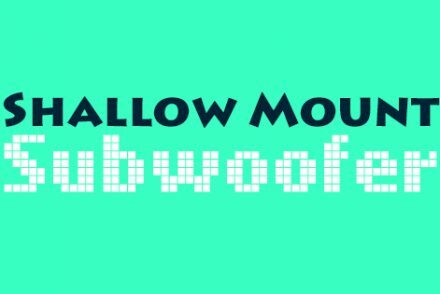 Thus, the crossover will divert the highest frequencies to the tweeter(s), mid-range frequencies to a sub-woofer, and low bass frequencies to large woofers. Depending on how, and where the speakers are mounted relative to each other, this arrangement will generally provide a superior reproduction of the music or sound track from the head unit. One disadvantage of component speakers is that they often require more power to operate than coaxial speakers, meaning that for many component speaker installations, an amplifier will be required to provide adequate power. Most coaxial speakers, also known as “full-range speakers”, consist of a tweeter and crossover mounted on top of a larger speaker in the same chassis. The obvious advantage of this arrangement is that the speakers are much easier to install than component speakers, and in most applications, no modification of the vehicle interior is required. However, as with anything else, what is gained in one area is lost in another, and in the case of coaxial speakers, the loss involves sound quality, since the drivers (speakers) are located too close to one another. This is especially noticeable in 3-way, and 4-way coaxial speakers, where three or four speakers are mounted on the same chassis. The result can again be compared to the resolution of a photograph; in this case, if the object being photographed is too close to the lens, some parts of the total picture might be out of focus, which is roughly analogous to what happens when too many speakers are mounted too closely together. Some sound frequencies might be drowned out or masked, meaning that the overall image of the total frequency mix becomes “blurred”, or incomplete. Below is a short selection of component speakers that we believe offer value for money, and reliable performance at all listening levels. While some items on this list may seem expensive, it must be remembered that you get what you pay for- the more you pay, the closer you get to concert-hall sound quality. The new 2007 DB series component speaker system from Polk now features improved sound reproduction and a new look, but at affordable prices. An included adaptor ring makes it easy to fit both 6.5”, and 6.75” versions of the DB6501 speaker system. System includes a standalone two-way Butterworth crossover that features a vented housing, and an electronic protection circuit for the tweeter. Woofers feature an advanced, composite polymer/mica cone suspended by a butyl rubber ring, and a Kapton voice coil former. The 25mm liquid-cooled tweeter features an advanced, composite silk/polymer dome that is driven by a neodymium magnet for clear, undistorted high frequency reproduction. The DB 6501 system consists of a 6.5” woofer and a separate tweeter and crossover that makes this system a perfect replacement for OEM speakers. This speaker system also works well with aftermarket component amplifiers and head units. The Polk DB 5601 system is also fully approved for marine applications, making it the system of choice to use on boats and water craft of all sizes and descriptions. In fact, this system is as standard equipment to the award-winning Nautiques ski and wakeboarding boats built by Correct Craft. The HSK 165 XL component speaker system represents the ultimate solution for those who are looking to replace OEM speakers with versatile, high-tech, and innovative replacements. 25mm tweeters features Neodymium magnets. Speakers deliver maximum output of 250 Watts. Maximum RMS is 125W per side. Voice coils are made from pure copper. Moreover, the crossovers come with adjustment capability that can be tailored to individual tastes, or to suit the interior of the vehicle to maximise the performance and efficiency of the speaker set. The Infinity Reference 6030cs 6.5” component speaker system offers several design features that make this system the perfect replacement for OEM speakers, all without having to replace the head unit. Speakers offer an impressive 270 Watts of peak power at 2 Ohm impedance. Improved rubber surrounds and Plus One woofer cones increases overall performance and efficiency of the speakers, producing increased bass output as one result. Textile dome tweeters are edge-driven, increasing sound clarity at high frequencies, and decreasing sound distortion at high power levels. Crossovers are laboratory-optimized, and offer adjustment for improved tweeter performance and efficiency. Speakers come with a one-year warranty. The 2-Ohm voice coils run perfectly off a standard unit or an aftermarket amplifier, mainly due to the combination of the Plus One+ cone, and a specially designed high-roll rubber surround that keeps distortion to almost undetectable levels. 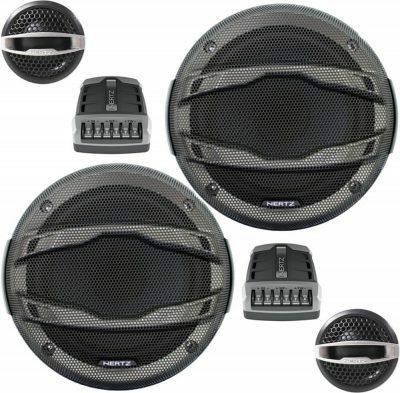 Infinity engineers have also adjusted these speakers to accommodate the relatively small OEM speaker conductors in most OEM applications to make it possible to run these speakers ,that feature true 4-Ohm technology, safely off OEM head units. 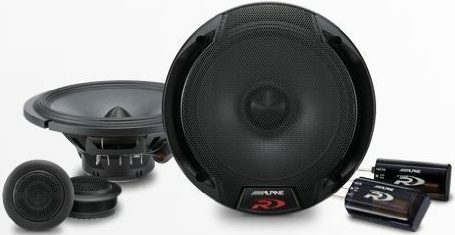 Among the many design features that has made Alpine a world-leader in sound technology, the Alpine SPR-60C component speaker system offers cones made from a multi-layered hybrid fibre that is suspended from a high density polymer frame that provides more rigidity, and less weight than comparable steel frames. Speakers offer a peak power output of 660 Watts per set; 330 Watts per side. 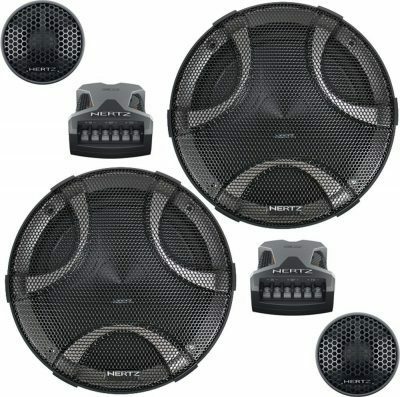 Speaker deliver a maximum of 220 RMS per set; 110 RMS per side. Speakers respond best between 65Hz, and 29KHz. Other innovations include Wave Guide technology that increases cone stability by eliminating random vibrations of the speaker cone that cause sound distortion at high output levels. Moreover, Alpine’s Wave Guide technology is augmented by their proprietary Linear Drive Motor that ensures true linear motion of the cone throughout the speaker’s excursion range, thus ensuring high quality sound at al all output levels. V-cone® design offers excellent off-axis response, producing clear and undistorted mid-range sound. CX 200.5 crossover features LP/LP at 3KHz. Speakers may require an amplifier to get the best results. Extended, 2-year warranty is available at an additional charge. These speakers offer a water-repellent pressed paper cone mounted on a butyl rubber surround, a combination that delivers 100 RMS at a peak power of 300 Watts at an impedance of 4 Ohms. Other design features include a rubber cover for the magnet, pure copper voice coils, and Tetolon dome tweeters sporting Neodymium magnets. 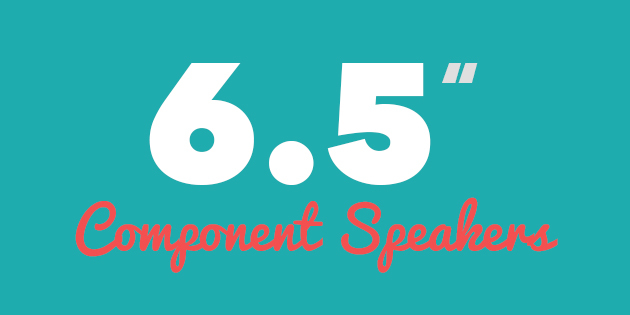 Despite the fact that component speakers are known to (usually)deliver superior sound quality when compared to coaxial speakers, much of how well a component speaker system works depends on the standard of the installation, the quality of the head unit/amplifier combination, and even the type of vehicle involved. Not all coaxial speakers are bad; in fact, in some cases they can outperform component speakers. So, when comparing, or shopping for speakers, it is important to compare apples with apples- large price disparities between two examples of different speaker types can be translated directly into large performance disparities. However, if modifying the interior of a vehicle to fit a complex component speaker system does not present an obstacle, component speakers will outperform almost any installation using coaxial speakers, but bear in mind that the more speakers you fit, the greater your need becomes to engage a professional installer. High quality sound installations are highly complex affairs, and to get the best results, or full value for your money, it is vitally important to get the basics right- which is where professional installers always begin. As with everything else on a car, all the components of the system needs to work together to get the best results, so consult a professional installer to make sure you get the basics right, i.e., match the wiring to the amplifier, and the amplifier to the speakers, or risk ruining your installation, or worse, setting your car alight.